Pressure cooking softens the potato skins so they can add their color and nutritional benefits to this mashed potato recipe. Fresh garlic tends to lose its flavor under pressure, so mash it into the cooked potatoes just before serving. It's hard to believe this beautiful side dish is ready to serve in just 15 minutes! A time-saving recipe like this is perfect for holidays and entertaining, because when you use the MultiPot pressure cooker it doesn't use up another burner on the stove top! Pour water into your pressure cooker pot; add potatoes and salt. Sprinkle garlic over potatoes and mash. Did you know half of the fiber of a potato comes from the skin? In fact, much of the nutritional value of a potato is also found in its skin. Red potatoes have very thin skin, so in a recipe like this it doesn’t detract from the taste or texture. This recipe is loaded with fiber, B vitamins, iron and potassium. Per Serving: 203 calories; 0g fat; 44.7g carbohydrates; 5g protein; 0mg cholesterol; 426mg sodium. These mashed potatoes were pretty tasty! I added 2 more cloves to make it extra garlicky. While I liked the simplicity of the recipe, it kinda screams 'add a gravy or some butter' to lift the flavor up a bit more. These simple garlic mashed potatoes and easy and delicious! You can add butter if you want, but you absolutely do not have to because the texture is so creamy and the flavor is very good on its own. I love being able to make these in my pressure cooker in under 30 minutes. Perfect! Can't go wrong with mashed potatoes. This version was really good, and much healthier than the version I would normally eat. I like that it's not made with fattening butter or cream, but still has great flavor. 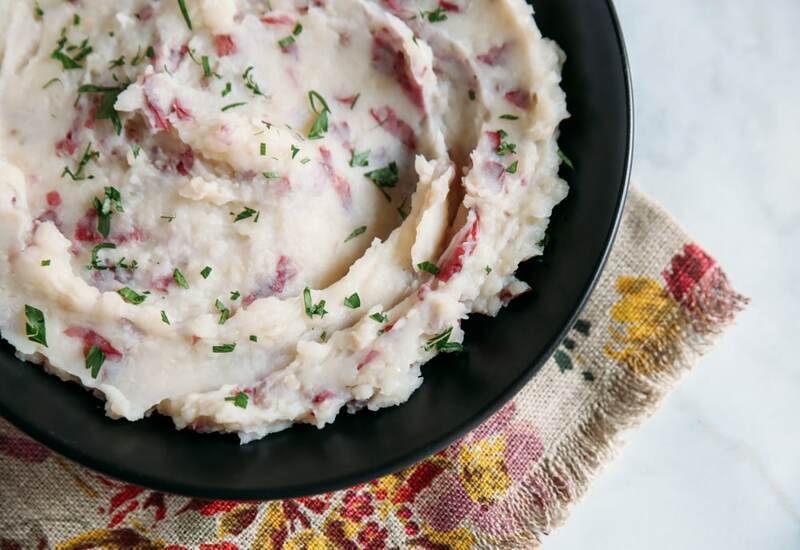 Love red potatoes, and this mash recipe is good. However, I added sour cream for texture. I know it’s not as healthy but still a requirement for classic mash. Red skin potatoes are the only ones I can tolerate with the skin on. These were really good, especially when mixed with cheese, chives, and sour cream. All the stuff that’s not really good for you but tastes amazing, ha! This is a great recipe.